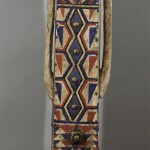 This unusual, colorful and detailed female coffin (sarcophagus) is cut by a woodcarver in the Ngate-tribe in Zaïre. The decorations, the colors and the shape of her female attributes is a fine example of how this people respect and care for the dead. 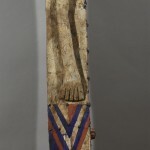 The female anthropomorphic polychrome coffins called bonganga-nganga. 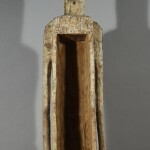 Coffin like these were carved during a period of up to four months in a secret forest temporary dwelling called esata. 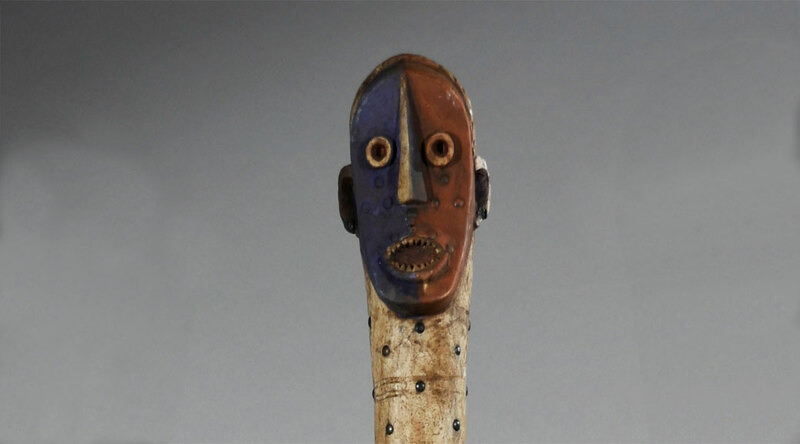 The 5.000 Ngata people (also called Ntomba) live on the banks of Lualaba River. Historically, the Ngata had an appointed leader, but today they live in autonomous farming communities. Ngata artists carved large anthropomorphic coffins called Bongange, covered with painted decoration. 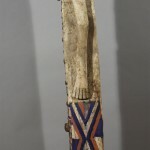 All sculpture made among the Ngata is related to their elaborate funerary rituals. 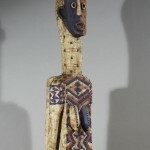 Best known are the very rare large wooden anthropomorphic polychrome coffins, which exist in both male and female forms. 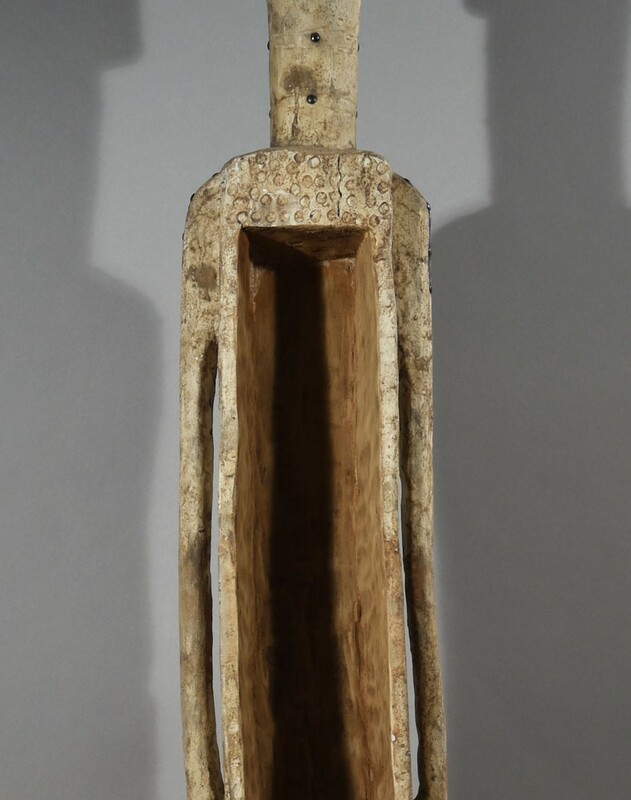 Reports about their use conflict, but what is certain is that they were carved in secrecy at a sacred clearing in the forest called Efomba by a ritual specialist woodcarver, bobongo, and the coffin is called bonganga-nganga. These large ones were made for big chiefs only, whereas smaller ones were made for lesser chiefs. Some accounts say that the corpse was buried first, and the remains dug up after a certain period of time. Then the skeleton was put in the coffin that was lowered into the river. Other accounts state that the corpse was put directly into a coffin and buried with it. Still others say that dug-up remains were put in a coffin that was displayed in a hut built on top of the tomb. This last version seems the most plausible. 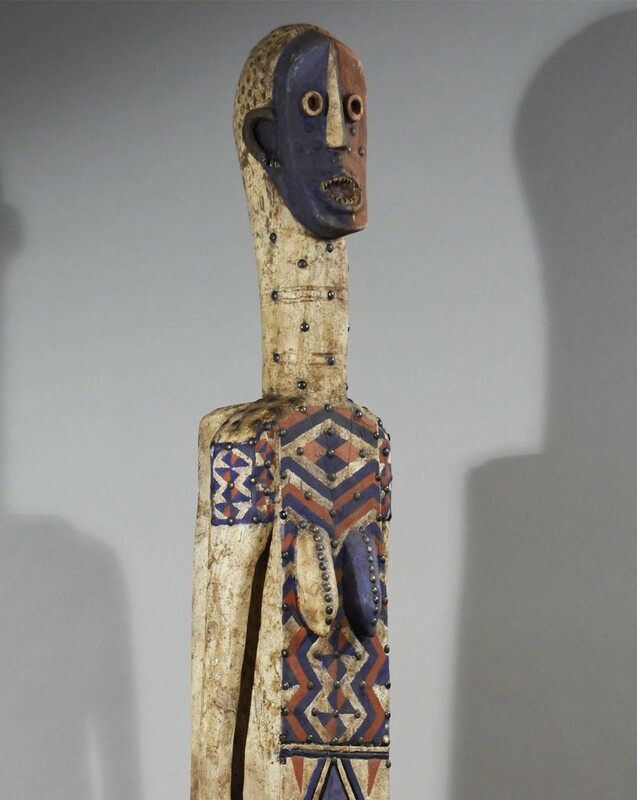 We know a few monocyclic funerary figures in the same style but smaller in size. These anthropomorphic figures were put on the tombs of important people, in a small house built solely for that purpose. Hunters of great prestige had zoomorphic figures in wood placed on their graves. Some accounts mention terracotta figures put on the graves of women, but these are otherwise undocumented. Provenance: Bought from Brussel gallery ex private Belgian collection.